This week’s 4 Nations Cup in Saskatoon marks the beginning of a new Olympic quad. It’s a time when we typically see teams make adjustments (three of the four competing teams have new head coaches) and gear up for the future. It’s also a good time to key in on player development, and assess the young talent that’s poised to break out. Some of these players have already contributed to their teams at the highest level, and others are just starting their national team careers, but all have high ceilings and should make an impact over the next four years. O’Neill was a late addition to the roster, but it’s clear she’s still held in high regard by Hockey Canada staff. She had a breakout year for Cornell last year as a sophomore, scoring 20 goals, 21 assists, and 41 points. She’ll be one of the youngest Canadian players at 4 Nations, but she’s already proven to be an extremely reliable player in tough situations. That should translate to a higher level of play, especially with her skillset. She plays with a lot of pace, able to move quickly in transition and create breaks, and we’ve started to see her offensive game really come together. O’Neill shines in other areas of the game, however. She’s great on the penalty kill—this feature from InsideHalton.com highlights that aspect of her game—and in the face-off circle. Last season, she won 54.6% of her draws, and through four games this season, she’s at 58.9%. Fillier is the youngest player on the Canadian roster. She won bronze with the Canadian Under-18 Team at the 2018 U18 World Championship, and then made the jump to the Development Team this summer, where she had a good showing. She just began her collegiate career a few weeks ago at Princeton, and through only four games, she’s scoring at a two-points-per-game rate, with a goal and seven assists. Fillier plays a uniquely mature game for a freshman, even besides the production. She’s already a key part of the Tigers’ offense and looks very poised in that role. I think her ceiling with Hockey Canada is really high, and though she’ll have plenty of time to grow into her own, that poise will help her immediately at this tournament, even if she doesn’t slot in as a scorer right away. Sarah is one of the best 200-foot players in North America. She sees the game at an elite level and is often one step ahead of her opponents. She contributes in all areas of the game. She can shut down opponents defensively and can also contribute offensively on the scoreboard. At just 19 years old, Nieminen has already played a featured role for Finland at recent tournaments. She was a productive member of the offense at the 2018 Olympics, with three goals, two assists, and five points in six games. With Luleå HF this season in the SDHL, she has four goals and five points in 11 games. Mustonen named Savolainen as another player from his Finnish squad with huge potential. She’s been a really active two-way defender with Luleå the last three seasons. During that time span, she’s scored a total of 16 goals, 37 assists, and 53 points in 78 games. Mustonen touts her as one of the best defenders in Europe right now. Waxin is the team’s youngest defender and the second-youngest player on the roster at 17 years old. She was a member of the Swedish under-18 team that won silver at the 2018 U18 World Championship. Despite her age, she’s already shown the potential to contribute at this level to head coach Ylva Martinsen. Waxin has taken a huge step forward at the club level with the SDHL’s MODO Hockey this season. She played 32 games in 2017-18 for MODO and scored four assists. In 19 games in 2018-19, she’s already produced four goals, eight assists, and 12 points, which ranks sixth among all SDHL defenders. At 18 years old, Nylén-Persson has already represented Sweden at the 2017 Women’s World Championship and the 2018 Olympic Games. She figures to play an important role on the Swedish blue line, both immediately and in the future. With Leksands IF in the SDHL this season, she’s notched three goals, seven assists, and 10 points in 15 games. Nylén-Persson captained Sweden’s silver medal-winning team at the 2018 U18 World Championship. Martinsen, who coached her with the U18s, says she has the leadership abilities to make an impact on and off the ice for the national team. Lonergan, a junior at Boston College, plays with a lion’s share of offensive talent, but she’s separated herself as one of the team’s—and college hockey’s—most dangerous players. Last season, she was second only to teammate Daryl Watts in national scoring with 75 points (30 goals, 45 assists). That’s more than double the 33 points she put up as a freshman, so it’s clear her game has already taken off in a hurry. She’s a good, fast skater who can make elite plays in tight areas and with speed. Her creativity and play-making abilities make it very tough to keep her out of high-danger scoring areas. In one-on-one situations, she’s not shy about using her skill to beat defenders and create space for herself. Lonergan also possesses the vision and passing abilities to create good chances for her teammates. 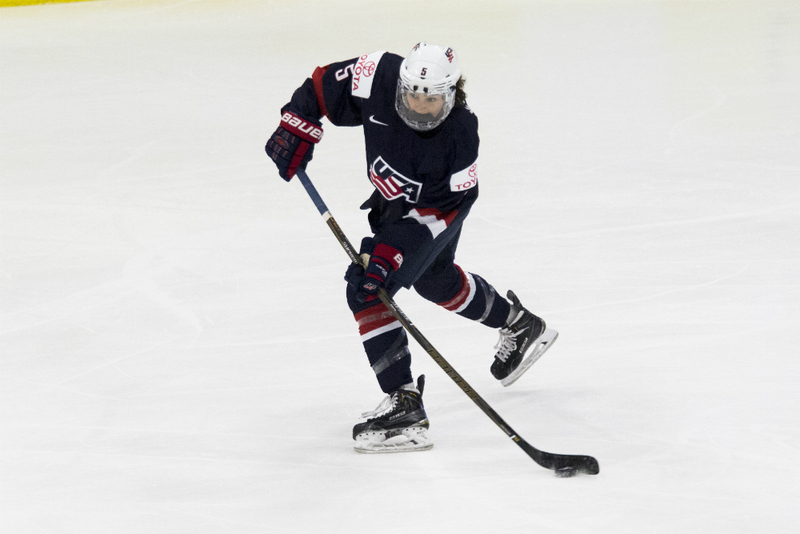 Though Team USA typically has the depth to carry four lines that can score, she has the potential to produce at an elite level and become a true top-six forward with the national team. A teammate of Lonergan’s at Boston College, Barnes already won an Olympic gold medal with Team USA back in February, so she’s no stranger to playing at the highest international level. But at 18 years old, she’s still the team’s youngest defender, and has one of the highest ceilings on the team in terms of what she can still become at this level. Last season, Barnes saw time on the power play for Team USA, and that’s a role she can carve out for herself for the long-term. As you can expect from a smaller player (she’s listed at 5’3″, making her one of the shortest players on the team), she’s a mobile defender who moves her feet well, and she contributes a lot to the transition game. She’s an attack-minded blue-liner, but I think there’s another level she can get to in terms of driving offense inside the zone and creating more grade-A chances, so we’ll see if she can show more of that flair this week. For further reading on Barnes, you can check out this feature from The Victory Press earlier this season.